Backpacker lodges and hostels, in previous years, only serve as a place for travelers to sleep, take a bath, and secure their stuff. One of the reasons is that everyone wanted to visit all tourist attractions nearby within a limited time. With these, hostels tried a different way on how they will make their visitors stay inside the hostel’s premises longer. Hype it up! I can stay in the lobby all day. The solution, which is actually a trend nowadays, is to hype up your place, make it colorful, introduce new things, style and make it hip so your guests will be hesitant to leave their temporary abode. 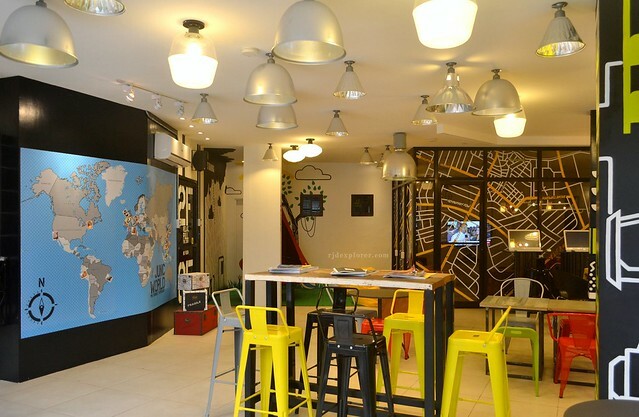 One of the hostels I’m pertaining to is located at General Luna and Don Pedro St in Makati City, Junction Hostel. 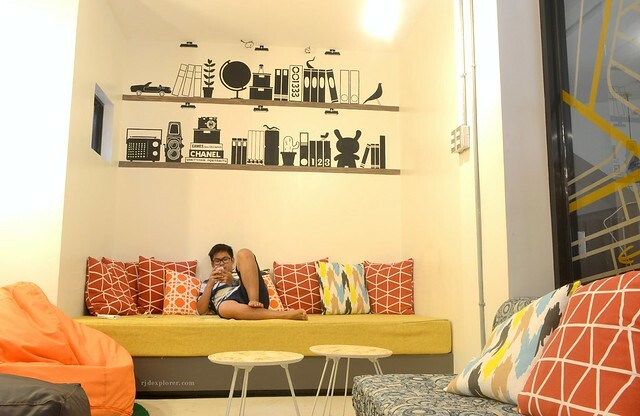 Junction Hostel, that can be found in Poblacion, Makati, had its soft opening last February 2015 and focuses on dorm housing. I just got back from Baler that one rainy midnight and I badly needed a place to reenergize and catch some revitalizing sleep. My searches led me to the hostel. Bunk-beds or not, you have the final say. As of the moment, they have 4 floors (including the Mezzanine) with the third currently under completion to lodge more travelers. 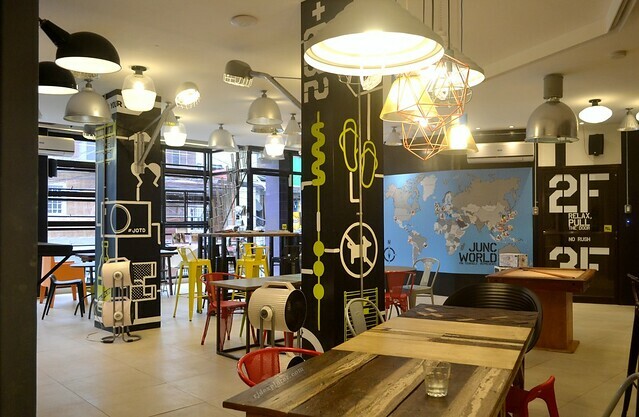 With the set-up, they still have the backpacker hostels main goal, to let the guests, from different parts of the globe, interact with other travelers, share their stories, and make new acquaintances. There are different kinds of room that cater the need of groups, couples, or even solo travelers. They have a total of 27 rooms with 111 beds, spread on Coed Triple, Quadruple, Six, Ten En Suite, and a Female Bed En Suite. They will not force you to share your room with other people as they also have limited private rooms with twin and queen beds. 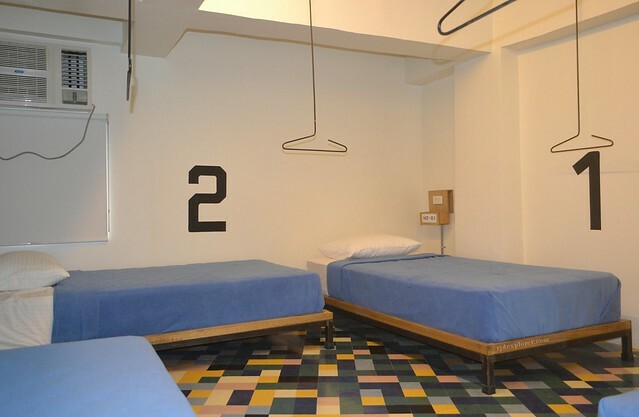 Aside from the rooms, beds are also numbered! With this option, upon filling in all details on the guest form, I was toured by a staff for me to decide what kind of room to avail. After the short roam, I decided to settle with a private room because it was already sleeping time and I might disturb other travelers when I stay at the coed rooms. Vibrant hallways with the colorful vinyl-tiled floor. 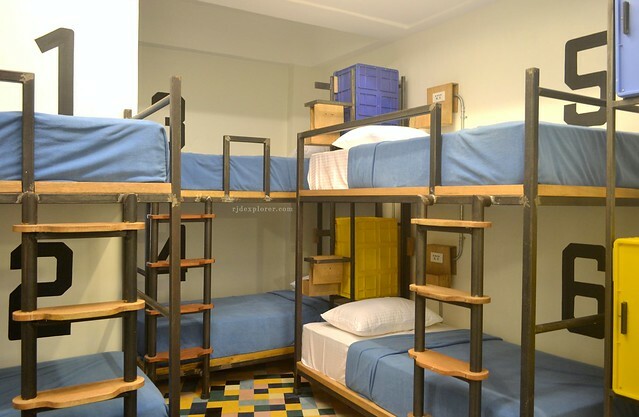 Generally, since they still have the dormitory type of accommodation, some shared rooms are a little bit crowded with the bunk-beds and other room amenities. 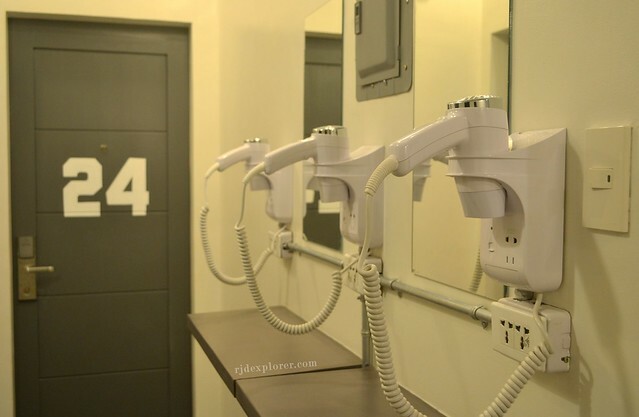 Every room has its en suite toilet and shower and an additional lavatory while every bed has its own locker, made of wood or hard plastic, and a charging box that you can also use to lock tiny stuff. It was also nice to see that beds on the shared rooms were numbered for the staff to know your bed assignment. Some private rooms are located inside the coed rooms, just like 26C, separated from the coed area of Room 26. Bunk-beds or not, a thick mattress will be your companion for an astounding sleep and will take charge in re-energizing you from the long day you had. En suite toilet and shower are not that huge but has the essentials, shampoo, and shower gel. They can also provide fresh towels upon request just in case you forgot to bring one. Common bathrooms are also available per floor to resolve long queue issues. They also have several hair dryers and lavatories, as well. Hey ladies, this area is dedicated for all of you! 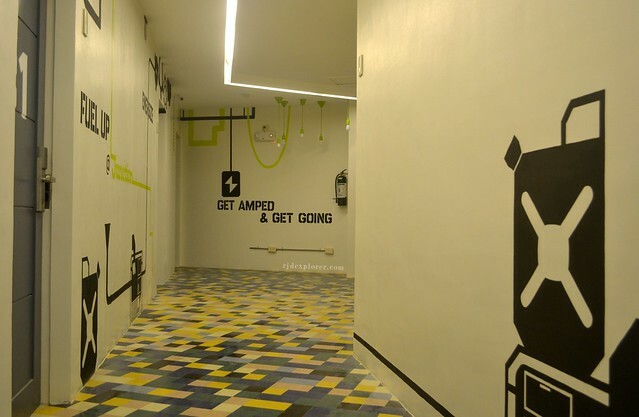 If hotels have dim hallways to compensate classiness, Junction Hostel made its hallways bright and quirky with graphics, and travel quotes. 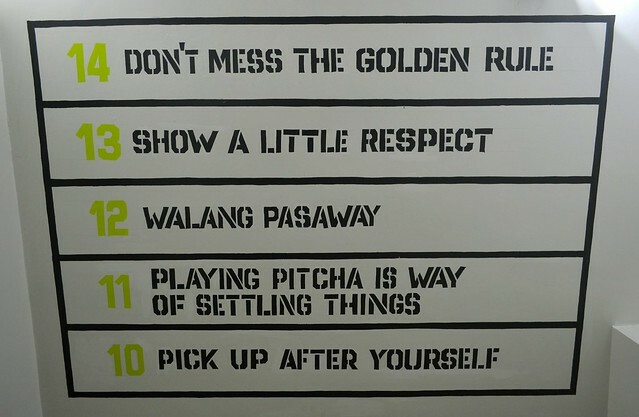 Using the stairs, you need to internalize the 14 Junc Room rules you should follow when you proceed to the upper floors of the hostel. 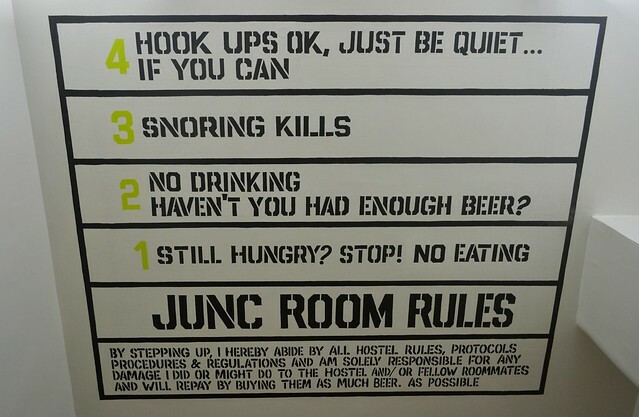 14 Junc Room Rules every guest must follow. Food are not allowed upstairs and inside the rooms. They strictly implement mingling with other guests so stay in the common kitchen and dining area when you have a food to consume. It’s alright to bring food from the outside, they don’t charge any corkage fee plus they have microwave oven and toaster that you can use to reheat your meal. Utensils are also being offered but please be sure to clean them after usage. 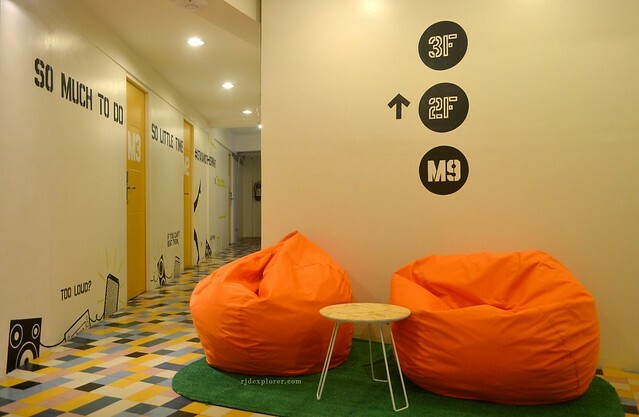 Spacious and quirky lobby of Junction Hostel Makati. The best part of staying in hostels is when you get a chance to meet other travelers and share stories. For this, the owners designed the lobby to be the chicest place on the entire place for travelers to be required to lounge and interact with other guests. Garden area has a cute red cocoon that can support up to 300 pounds, one person at a time. Bean bags are also available. Dining area and the garden area with the cocoon. No footwear on the garden, please! One side of the wall was also made into a monthly calendar with all the activities all over the country plotted. Adjacent is a world map dedicated as a souvenir area where guests can pin their photo on their place of origin in the globe. They also have a pool table you can play during hangouts. My favorite spot is the entertainment room, not for the television but for the classy couch. Spent most of the time here. They also have a so-called food truck that can cater your food needs. 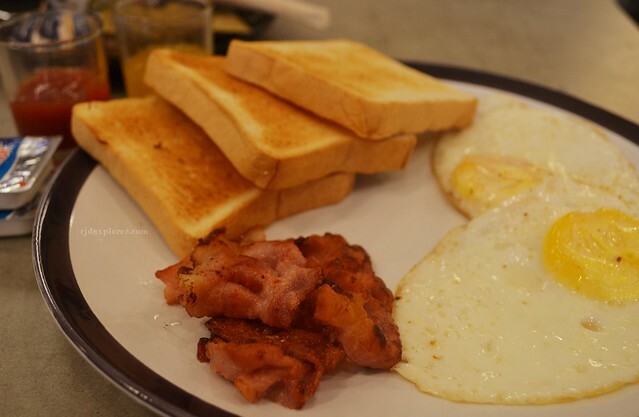 Breakfast is not complimentary and can be availed at Php200++. The food options being served are still limited as of the moment; they have some platters to choose from. I had a bacon platter, served with 3 slices of toasted bread, pineapple jam, 2 sunny side-up eggs, and coffee. The goal of keeping the guests to stay longer was achieved during my visit. I was thinking of having another night but I needed to go somewhere. 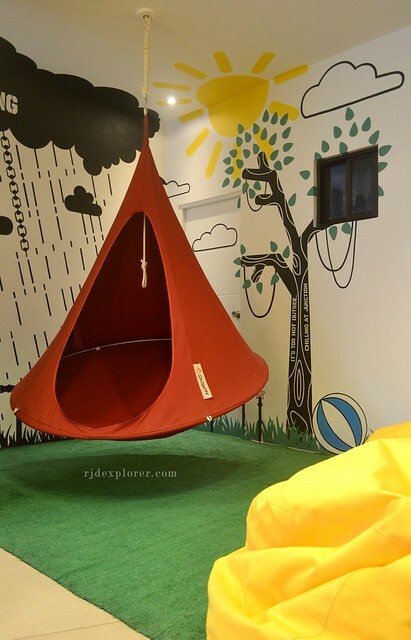 I will definitely go back to Junction Hostel, a cool and funky place to stay in Makati City. Oh, before I forget, they also have free WiFi at the lobby. 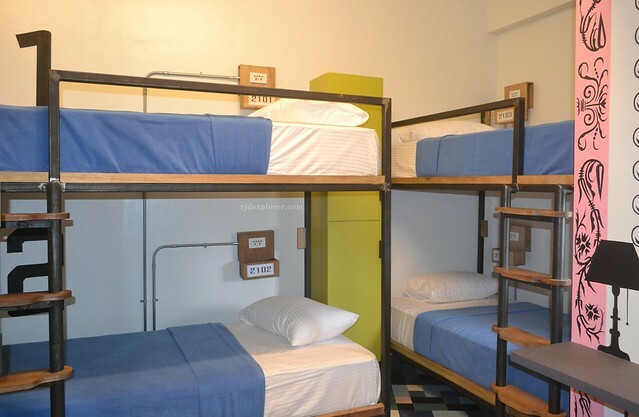 Book a stay in Junction Hostel Makatihere for discounted rates.